We’re all in the same boat. The Super Bowl has just ended and you already feel the void of sports and football in your life. The NBA is prepping for the All-Star festivities and anxiously awaiting the playoffs (for some, cough, cough… New York Knicks the May 14th draft lottery), college basketball conference tournaments and March Madness are just around the corner, and pitchers and catchers report to spring training in about a week or so. There isn’t much appeal in sports overseas either, as the English Premier League (other football) remains competitive in the standings, but the Liverpool Reds will likely secure the league for the first time since 1989-90, led by the current top goal scorer in the premiership, Mo Salah (He’sComingDownTheWinggg). Nevertheless, the NBA has not only found a way to steal headlines from the NFL during America’s glorious Super Bowl week with Anthony Davis rumors and Kristaps Porzingis blockbuster trades, but the league has also had the sports and media tabloids scrambling and looking for comments regarding 2019 NBA free agency. This is remarkable because not only does free agency commence in five months (July 1st), but any word or slip of the tongue regarding the interest of a player currently under contract, results in penalties that usually amount to monetary fines. Basically, that means there’s no news to be made or told here, just endless five month speculation about what teams may or may not be thinking, how players may or may not be feeling, and people then turn to social media and turn ‘likes and follows’ into news… also known as… nonsense. Beginning in the 2018-19, the NBA (whether incidental or not) has bridged the gap between sports withdrawal and the NBA All-Star Game festivities. After Demarcus Cousins was informed about his trade to the New Orleans Pelicans during an interview in New Orleans, during All-Star weekend, the NBA decided that the trade deadline would be moved earlier and this year, it fell three days after the Super Bowl. That means when the Super Bowl champion (Those Who Shall Not Be Named) are parading through their streets for yet another ring; Adrian Wojnarowski, Shams Charania, Ramona Shelburne, and the rest of the NBA reporters will be jostling their way to the top of your social media news feed to update you on the latest rumors and NBA trades. For the next 3 days, buckle up because the NBA will be a reality show that you can follow in real-time through #NBATwitter. The only difference is, we kind of already how this season ends… Warriors in a three-peat. As per usual, the New York Knicks are making headlines for everything besides their actual performance on the court. But for good reason, because as we all know, the Knicks are in full-on tank mode and are currently sporting the league’s worst record and the best odds at the #1 pick in the NBA Draft Lottery. As you may have heard, the New York Knicks traded Courtney Lee, Tim Hardaway Jr., Kristaps Porzingis, and Trey Burke for Wesley Matthews, DeAndre Jordan, Dennis Smith Jr., and two future first round picks. The Knicks effectively showed their hand to the NBA universe with this move by accumulating draft picks, shedding contracts that would spill into next year’s cap space, acquire veterans on expiring contracts, and the young Dennis Smith Jr. The New York Knicks have apparently already started their 2019 offseason and I don’t believe they’re done yet. Beginning today you will hear endless rumors about what this team doing and what that team is thinking. So to spare ourselves agonizing over crazy scenarios and hypotheticals about trades and free agency, as Knicks fans, let us simply breakdown the team’s current and future salary cap and roster situation. The contracts on the books for 2019-20 roster are: Dennis Smith Jr., Frank Ntilikina, Allonzo Trier, Damyean Dotson, Kevin Knox, Lance Thomas, and Mitchell Robinson, with a little over 70$ Million to spare. In addition to the above players, the current 2018-19 roster contains: newly acquired DeAndre Jordan and Wes Matthews, Mario Hezonja, Emmanuel Mudiay, Enes Kanter, Luke Kornet, and Noah Vonleh. Look… plain and simple… it’s a long shot. If the Pelicans want to get rid of Anthony Davis before the deadline due to team chemistry and they don’t want to trade him to the Lakers, I am sure the Knicks will do their best to try and swing a Frank, Knox or Mitch, and a couple of first rounders for Anthony Davis and another contract they don’t want– depending on if Davis agrees to an extension with NY prior to the trade. Other than that, let’s just forget about AD, and move on. The first note is that newly acquired players, such as Matthews and Jordan, can NOT be in a packaged deal. Meaning if either of these two players are to be dealt within the next three days, no additional players from the Knicks may be added in the transaction. One rumor that has run down the mill on the Monday after the Super Bowl was by Marc Berman of the NY Post, indicating that several teams are interested in the services of newly acquired Wes Matthews. From contending western conference teams that are interested in the player’s services if the Knicks were to buy him out and at least one team has inquired about a trade, rumored to be their I-95 neighbor, the Philadelphia 76ers. I did cook up some trades that were confirmed logistically possible by the ESPN Trade Machine and would benefit both NBA teams such as a swap with the 76ers including Wes Matthews for Wilson Chandler, a 2nd round pick, and another player to match the salary. Or even Enes potentially being shipped to Sacramento for Zach Randolph and a pick to add some offensive production for the Kings. At the end of the day, Knicks should be looking to ship off dead weight for assets, even if they’re minor. If Mario Hezonja, Emmanuel Mudiay, and Noah Vonleh, have no future with the team beyond this tanking season and given the impending superstars in free agency, any value the Knicks obtain for these players will be great assets for the team. Furthermore, I would not be surprised if either of these players re-signed this offseason with the Knicks on cheap deals to join a winning squad. I know many are done with Frank, but I still see hope and potential around the kid if he played on an actual cohesive team. I love the French Prince and I want to watch him grow with a team that plays defense and has a ball dominant point guard. However, I am sure New York views Frank Ntilikina as just a young asset that still may be moved if the Knicks see no future in the rotation for the point guard and another team values the young guard’s potential. 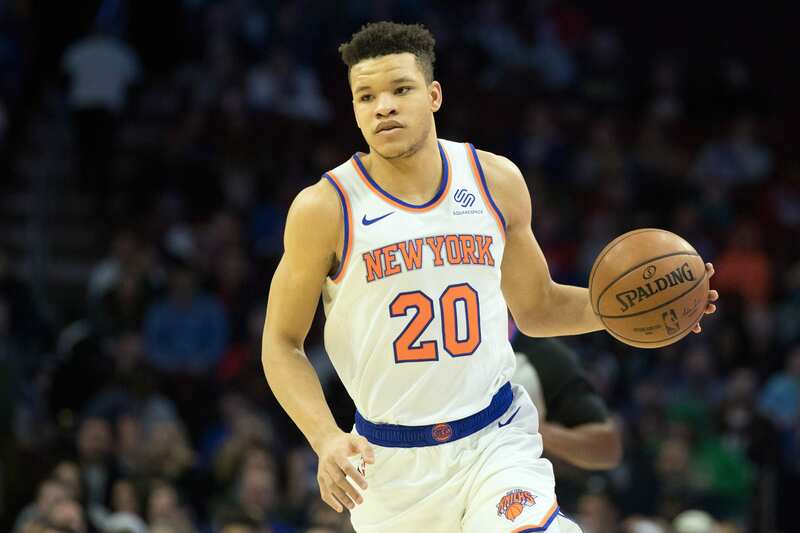 With the newly acquired Dennis Smith Jr. on the team for the foreseeable future and the likes of Kyrie and Kemba seemingly on the Knicks dream acquisition list, I would not be surprised if New York is sending out “feelers” around the league to inquire about Frank’s value at the deadline and in the 2019 offseason. Enes Kanter, who has been receiving ‘Once a Knick, Always a Knick’ treatment from the Garden faithful lately, has more incentive to be traded than stacking up his stat sheet for free agency this summer; Kanter has a 15% trade kicker. A trade kicker is a perk in a contract that entitles the player to a percentage of his yearly salary if the player were to be traded. In this case, Kanter is set to receive about an additional 3$ million dollars on top of his 18.6$ million dollar current contract for this season, if and when the disgruntled and disruptive forward gets traded.